With a knife cut the tuna into very small pieces (as shown in picture 7). Mix into the finely diced tuna, add a drizzle of olive oil. 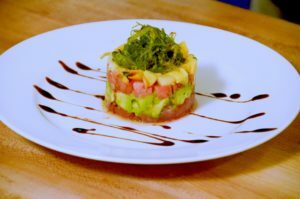 Using 3-inch mole combined tomato -avocado -mango -tuna. Finish with aged balsamic reduction drizzle.